This is a very practical, one day interactive course delivering real skills to all abilities. SAQ® PSM Training is a system of progressive exercise and instruction aimed at developing fundamental motor abilities, balance, co-ordination and ultimately complete control of body movement. Please note: Parking is available in a Pay & Display car park opposite the venue. All coaches, trainers and managers want athletes with explosive acceleration, lightening responses and reaction, control of movements and a reduced incidence of injury. All athletes whatever their size and shape, whether young or old, professional or amateur can improve their fundamental movement ability and enjoy the tremendous performance improvements that SAQ® PSM Training can provide. To provide coaches, trainers, teachers, parents, and those involved in all sports, recreational physical activity, health & fitness and physical education with knowledge and practical skills in SAQ® PSM Training. 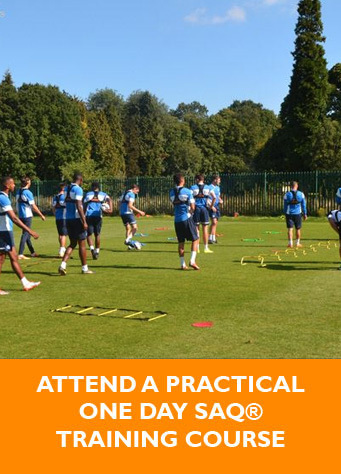 To be able to demonstrate SAQ® activities and present a short practical session taken from the SAQ® Continuum. Design & deliver a short session from the SAQ® Continuum. Coachwise Ltd, the trading arm of Sportscoach UK, promote SAQ® resources. Insights on how to best use SAQ® PSM Training and the SAQ® Continuum to assist with: Conditioning performers in sport, improving movement in Physical Education, Personal and Circuit training solutions, fun, flexible and sustainable activities that will promote participation. Coaches, strength & conditioners, personal trainers, physiotherapists, teachers, parents – literally anyone with a keen interest in sport, fitness, exercise and movement development. NB REPS registered delegates should have any Level 2 Coaching / Training Award as a prerequsite.